HCM City (VNA) – The southern economic hub of Ho Chi Minh City is improving its business environment to create the best conditions for foreign enterprises, including those from Singapore, to make productive investments. 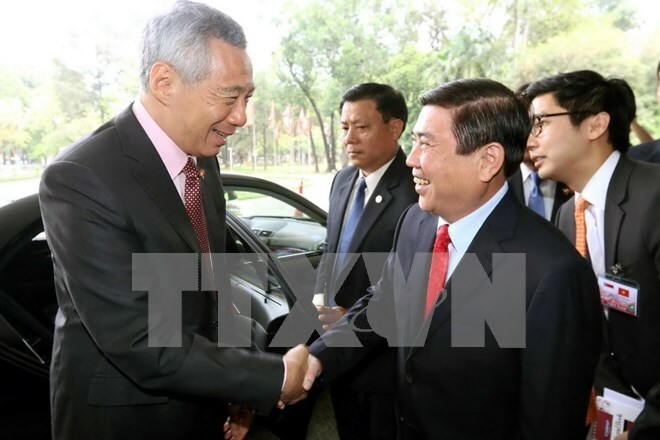 Chairman of the municipal People’s Committee Nguyen Thanh Phong made the remark at a meeting with Singapore’s Prime Minister Lee Hsien Loong, who is in an official visit to Vietnam, in HCM City on March 21. He said HCM City has pioneered in promoting cooperation with Singapore and hoped the country – as the biggest investor in the city - will carry out a major investment project to symbolize their sound cooperative ties. The official suggested Singapore step up cooperation and investment in clean food industrial parks, provide technological support for planning management and metro line development. The southern metropolis wants to receive more assistance from Singapore in improving human resources quality and learnt from its experience in urban management and development, and smart city building, he added. He also reiterated Vietnam’s consistent policy of tightening the friendship with Singapore on the bilateral and multilateral basis for the sake of the two peoples as well as for peace, stability, cooperation and development in the region and around the world. Prime Minister Lee Hsien Loong said the relations between Vietnam and Singapore have been increasingly reinforced and developed over the past time, illustrated by the strong growth of the 21-year-old Vietnam-Singapore Industrial Park (VSIP). The presence of over 900 projects invested by Singaporean firms is a vivid demonstration of the country’s interest in HCM City, he said, adding that Singapore hopes to conduct more cooperation activities with the city, including the exchange of officials and experience sharing in metropolis management, building and development.